BA bolts are readily available on e-bay bur you may have a hardware shop in your area who stocks them. Measure the diameter and check with data tables or find a tame model engineer. Get washers to fit. An isolating transformer should not cost a lot. I picked a RS one up at a show in Birminham for I think £4. It was plenty heavy enough to carry home. I recently bought a bigger one from the local amateur radio club, I may have gone wild and paid £1. It needs to be opened and the earth wire disconnected. You could try asking for one in the wanted thread. Always use an earth leakage trip, I have them all over the place. I don't think I've ever seen a BA bolt, though they may exist. Plenty of (set) screws though. Isolation transformers are very handy to allow connection of earthed test equipment but any earth leakage trip on the primary side will then do nothing as far as the set is concerned. You would need to earth one side of the secondary and fit the trip between the TX and the set for any useful effect, but then you're back to square one safety wise anyway though you could still use grounded test equipment. Be wary, stand on an insulating mat and never let both hands near a live set! Remember that getting yourself across the HT on an isolated set can still be deadly. BA bolts are frequently used by model engineers. They often have hexagon heads a size smaller than standard to give a better scale appearance. Vintage radios generally use set screws though. Bolts have an unthreaded portion under the head. Set screws are threaded right up to the head. Model engineering- I did wonder. Anyway, found a picture of some. Their lack of utility for typical radio work is obvious. More excellent advice there from Trevor and Herald Michael [posts 20/21]. The difference between using an Auto [ie ONE tapped winding] Transformer....a TWO winding conventional Transformer..... or a "live chassis" ie NO transformer at all circuit [only live if the mains wiring is reversed] is explained in the PSU [Power Supply Unit] section of Paul Stennings great notes. Most valve radios have the conventional type where the two windings are only connected magnetically. An auto Transformer "taps" a voltage off just one so it's less isolated and not as safe. As Trevor said, you can buy an external [Isolating] transformer [with two windings itself] or [effectively] put a "proper" mains transformer [Tr] in place-two windings again! Either way you shouldn't be applying power yet so no rush although starting there and working towards the "front end" [where all the tuning takes place] is standard practise mechanically or when reading up the theory! I should say that a "conventional" two windings Tr is usually better but it does NOT guarantee safety.. just a separation from the full might of the mains. Often the voltage OUT to the rest of the set is the same as the mains coming in [at 240 AC]. It might even be quite a bit more sometimes, say 300v, or a lot less- eg 6.3v to light up the valves and the tuning scale. The "transform" principle works both ways. No I'm not in competition with Paul's Guide-you can't improve on perfection . I just think that some of this needs emphasising. Last edited by dave walsh; 11th Feb 2019 at 12:10 pm. Just a quick thought. As previously said (I believe) the A146C has a live chassis, the A146CM (modified?) has an isolated chassis. This is easily determined from the model number printed on the back cover. 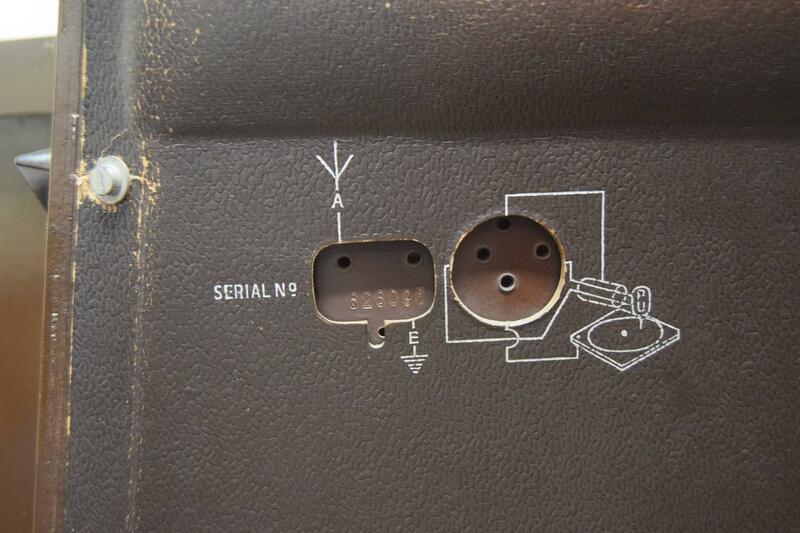 If all else fails (printing illegible for example) the way to tell the difference is the hole in the back cover for the GRAM (record player) sockets. The one in the A146C is round, the A146CM is cigar shaped. Yours appears quite legible however. N.B. The cabinet looks in decent condition and the speaker cloth appears to be original. I noticed that the tuning cursor is right up one end and another image confirms my suspicion that the tuning cord has snapped and will need to be re-strung. are all rubber insulated and will likely crumble to dust when disturbed - replacement is essential for safety. Thermionic Emission, cures depression, boredom and piles. Last edited by Nanozeugma; 11th Feb 2019 at 4:58 pm. A146CM mains three wires (earth added). With the set not plugged in but switched on, the A146C will have a connection between the plug and chassis. 1. Murphy Nut/Clive, I can tell by your name alone that you will be very helpful. Yes I noticed the room issue, the capacitors seem to have bent the backboard out of its flush intended design. Is there a particular specification of wire you would recommend? If possible I would strive to preserve the original colour variations. 3. Dave, yeah I will try and post less often once I have a game-plan sorted, then hopefully will only update sparsely as I progress through the restoration. Some of the advice is complex, but ultimately I feel like I am learning. As you say, the conflicting advice on the need for a Isolation Transformer is a bit confusing. I will try an acquire an AVO Model 7. Do I remove the components to measure their voltages etc? Or do I measure them in circuit? Thanks for keeping my straight on the GRAM inputs. Need to stop thinking of the final product and focus on the task at hand. 4. Trevor, thanks for the hint re:CPC. Screw terminals are similar to the screw systems inside plugs, correct? 5. Herald/Chris, I love all of your concern for my safety. I will get an insulating mat, and what about rubber gloves? 6. Station/Graham, thanks for the clarification on set screws. 8. Dave, I will read up on that section of the notes. Thank you for your emphasis, as I said, the concern for my safety on this forum is very reassuring. You all know what you're talking about, and ultimately you are putting my safety first. Great practice. 9. Nanozeugma, yes I am certain that my set is a A146C, but thank you for your advice. There is just one small stain on the speaker cloth, do you think it would be safe to hand wash? Yes the string is definitely snapped, I am not looking forward to replacing it. Replacing the wires has just become my top priority, is there any specific wiring you recommend? I may yet replace the mains cable as it is VERY short, it doesn't even reach the ground if I feed it out of the circular hole (not the GRAM one) on the back of the cover. 10. Trevor, thank you for simplifying the equation for this novice. I may just screw open the plug housing and count the wires to be extra sure. Two wires and one seems to be missing its covering. The CM [M for modified] 146 version would seem to be using the Auto Transformer idea [same as not having a Tr really]. Three leads with earth [as Nanozeugama and Trevor say P25+26]. This puzzled me a bit Normally you do NOT earth a live chassis as that will just blow the fuse. 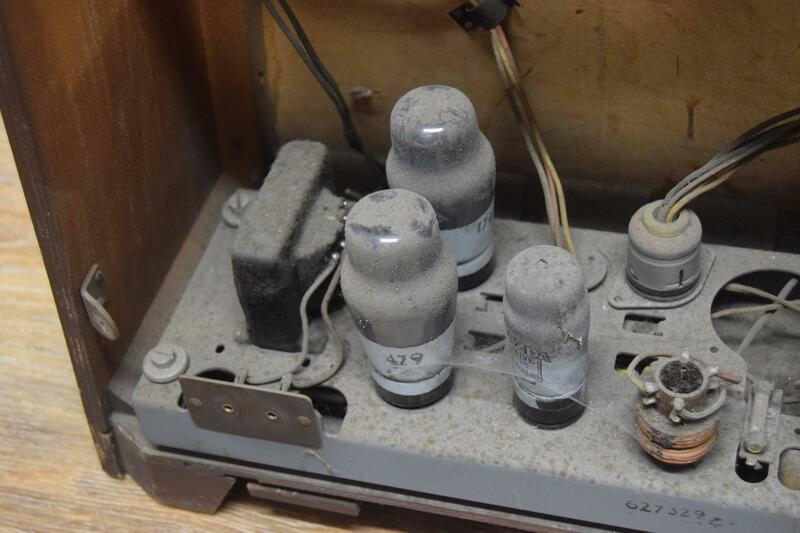 It seems that some sets eg the U124 as well [a sort of Murphy half baffle board design-curious] had a mains filter that needed earthing but this was done via an "isolating" [that word again] capacitor to solve the fuse issue! If you've just got a no Tr 146 then the Isolated Earth question doesn't apply-one thing less to worry about! Last edited by dave walsh; 12th Feb 2019 at 10:45 pm. I did have a 146 that crumbled to dust and came across it's the back board today purely by accident. [I'm looking for the "works" currently]. It was said previously that a I46C can be identified by a round hole on the board with a diagram showing where a Record Deck is plugged in. I have the round hole and diagram on mine. If you take a look at your set we can know for sure what model you have and that will be another step forward to the world of Frank Murphy. Clive has made a wonderfully entertaining video illustrating that he lives in a where Frank is still king! The A146CM has the double wound isolating transformer with the A146 having an Autotransformer, looking at the circuit diagram for the A146 though, it shows the chassis as a dotted line not connected directly to one side of the incoming mains as would be usual in that type of set. The plug looks horrible with the live wire by-passing the fuse. Replace the lead if the insulation is cracked. Used double insulated wire as the original. I mentioned the gromets since you cannot replace them without disconnecting all the wires. take a photo and replace any wires with the same colour. In general it is better to replace one piece at a time. If the wires go inside a transformer, it may be better to sleeve any dubious ones with heat shrink sleeving. The AVO meter model 7 is a thirsty beast and more suitable for dealing with power electrics. I would go for a model 8 or 9. Make sure it works. A smaller, more managable digital meter can be obtained for under £10 but they do not like high voltages, they should manage 250V if you use the correct range. Voltages can only be measured if the set is energised, hence all the talk about isolating transformers. Thanks for that Steve/ Trevor. I was trying to get this sorted/definitively ID'd so there is an agreed way forward but it might be more difficult than I imagined. Should the OP use an Isolating Tr for example, if it's the 146 with the round hole? I very much hope that my attempt to explain things hasn't made it worse for the him . He's very determined to restore the set though and doesn't intend to rush in too much. I meant to mention the Frank Murphy Biography "A First Class job" written by his daughter Joan Long. His personal story was quite sad in the end and not unlike that of J L Baird-especially re the business experience/betrayal. Very popular with his students when he died in Canada at a relatively early age. Last edited by dave walsh; 13th Feb 2019 at 12:17 am. 1. Dave, I definitely have a A146C. Look at the circular hole. 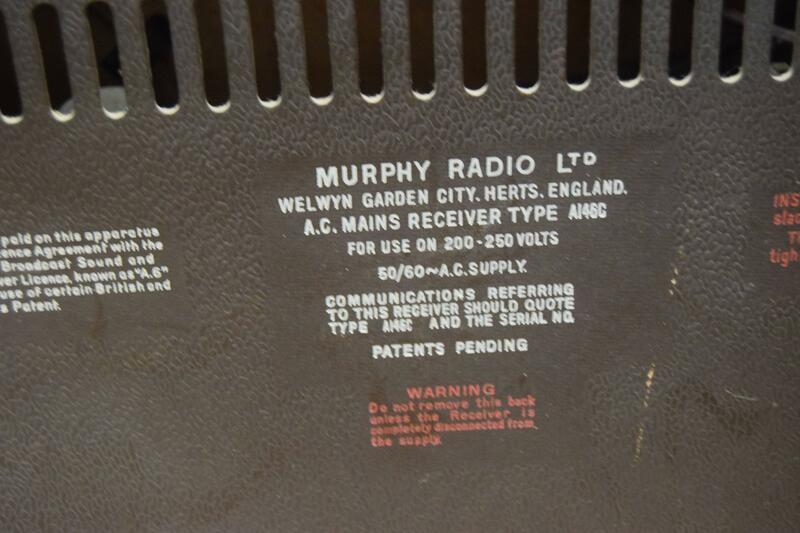 The marking on the backboard which says "A.C. Mains Receiver Type A146C". The presence of PEN 45s and a UU6 valve. And the aforementioned two-core mains plug sans earth. I am not sure what you mean by "negative pin", as the circuit is A.C. it has a live wire which alternates charge, and a neutral wire. I assume you mean neutral? 2. Music-Centre/Steve, unusual as in bad? Don't worry that plug has been completely disconnected (mains wire attached for now), so as I never forget the dodgy wiring and try to plug it in. 3. Trevor, plug gone. The lead for the plug is PVC (everything else in the set is crumbling rubber) so it doesn't inherently NEED replacing. However, I suspect it to be a replacement piece already and it has barely any reach once fed through the set, so I plan to replace it with a new mains lead regardless. The grommets will be replaced. Luckily, it seems to me that Murphy were relatively forward thinking with the 146C and no wires appear to actually go inside components. It is simply solder galore at different contact points. Also re:heat shrink wrapping, I believe I see some over some random points of the rubber wiring. I think this was probably a quick fix repair job in the past. I hope they didn't do any damage. Thank you for your advice on multimeters. 4. Dave again, I have already started ID'ing components. I have given the set a quick clean to remove dust etc, and am using micro-porous medical tape to write small labels to put beside components. And over wires so I can trace what goes to where. I will definitely look in to that biography! As someone with two literature degrees it will be good to read some non-fiction for once. Thank you. No, not bad, best to treat it as if the chassis could be potentially live (with the mains lead connected the wrong way round) I just had a quick look at the A146C diagram last night and it showed the chassis as a dotted line (unusual) so I wondered if they had still been able to insulate the metal work. Yes you are right Michael, I should have been more "neutral" but someone else might have queried that-there's quite a bit of semantics in defining radio terms as well I suppose. I hope my "explanation" didn't make you feel you were going around in circles [like the daisy chain]. Diagrams are so much better. I'm not so familiar with the Auto Tr version [despite having the "remains"] but all the products that had a possibility of the chassis going live [through into the sixties] were built to keep the owners safe. I've never heard of a 'shocking' domestic accident only when the chassis was out of the case and being worked on. I used to have a light bulb wired between mains earth and a clip on the metalwork which would illuminate any mistake. I'm told that would probably trip modern houses fuses now though. Given all that, I wonder If an external Isolating Transformer is really essential at all, if the Auto Tr and circuitry are renovated to a good standard but I would very much rely on the opinion of others for that-particularly if it all hinges on one isolating capacitor doing it's Job! I'm glad that you are keen to read the Murphy book. Some people only want this sort of thing for technical reference but the personal aspects are just as interesting [and sad] to myself. He was equally innovative in that area as well but I suppose his daughter felt the need to be circumspect within an otherwise fascinating read! I think at least one member here has the Canadian Radiogram Model he produced before a sudden demise but I've not found out much more about that really despite asking a friend in Ontario to try and check it out. I have been told that some have successfully hand washed stained speaker cloth if done with care, but have not done so personally. You would have to bear in mind that in order to do so, you would first need to remove the loudspeaker, then the baffle board to which the cloth is glued, then tease the cloth off. Be aware that it will be fragile, being 70-ish years old; also that washing will not address fading. In regard to suitable cable to replace the life expired rubber stuff, the best I can do is direct you to two sources that I have personally used. For the mains cable, flat or circular profile mains rated PVC covered twin is readily available in numerous outlets. you don't need anything fancy, 5A is fine, the radio draws less than an amp at full throttle. Last edited by Nanozeugma; 13th Feb 2019 at 5:24 pm. Reason: Typo corrected. Once you have got your Murphy up and running, audio quality on the BBC MW stations will be subject to restricted bandswidth and Optimod compression but fear not. Tune to RTE1 and your efforts will be rewarded with an audio quality second to none. The engineering of 252 kHz was originally for a pan Irish and UK/Europe commercial station Atlantic 252 of 500Kw ERP during the day and 100Kw at night. Whatever the RTE engineers have done since then, the results are extraordinary and make for a very listenable station. The only downside is the sometimes "local" choice of music and waiting ages for the chimes to finish before the news broadcast. Thank goodness they don't use a 24 clock! 1. Dave, diagrams are definitely saviours. I have ordered a physical duplicate of the service manual to have something concrete to work off. I will definitely grab that book off of AbeBooks. 2. Nanozeugma, yeah the glue is making me rethink that proposal. Thank you for allaying my tuning cord fears. I will look into those links once I decide roughly how much of each colour I need, thank you I got a new mains cable. 3. Simpsons, thanks for the RTE 1 tip. Shouldn't be hard to get as I live 20 minutes from Donegal. It's the local music that worries me haha RoI gets more and more into American Country Western music every year. All times are GMT +1. The time now is 7:41 pm.